Last week, Mackenzie had a half-day of school so 3 of us moms and 5 daughters headed out to get pedicures. 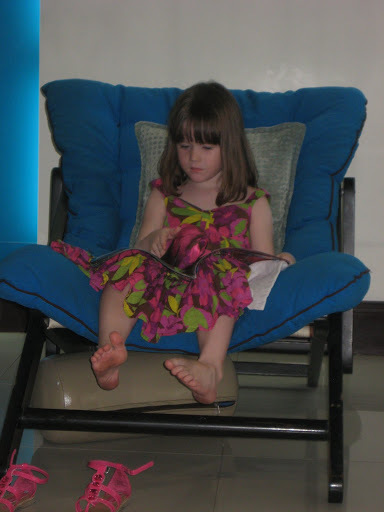 It’s so fun seeing the little girls all lined up, thumbing through magazines and loving their pretty toes! I just snapped one picture of Bella ’cause she just looked so cute! 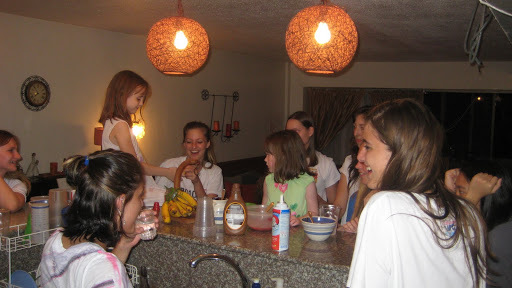 On Tuesday night, I had my volleyball girls over for ice cream sundaes and to watch our video footage from Korea. We had a blast together again. Mackenzie and Bella loved being “one of the girls.” They kept throwing cherries up in the air for the volleyball girls to try and catch in their mouths. Wednesday was my last day to volunteer at Bella’s preschool! After an entire year of forgetting, I finally remembered to bring my camera. 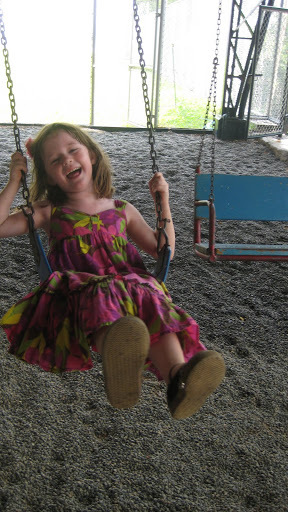 I love watching her belly-laugh on the swings. 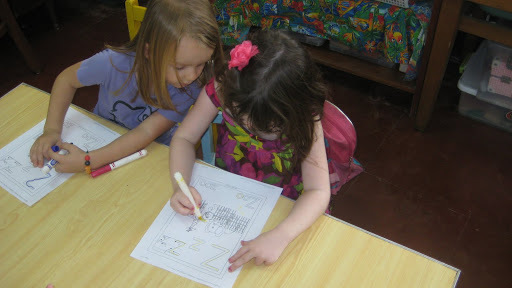 Bella and her little [cheater] friend practicing the letter “Z”. 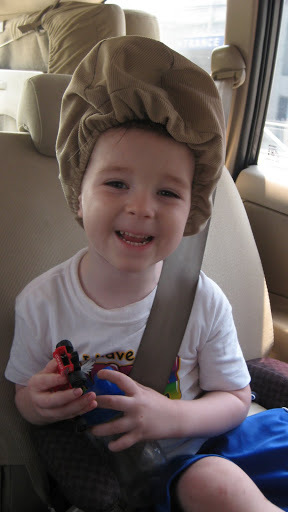 Today I turned around in the car and saw Deacon sporting the headrest cover. I’m stressed out trying to pick out paint colors for the living room, but this picture makes me forget about all of that and giggle. Can I tell you why I’m stressed about paint colors? Because they don’t let you bring the cardstock samples out of the store!!! In the US, when I’m choosing paint, I just grab a handful of my favorite samples, tape them up here and there so I can glance at them, stare at them, double-take at them, walk casually past them, run agressively past them, try different lighting…you get the idea. So….I had to bring in a wall hanging that I’m trying to match and from a book of a billion colors, find the perfect one. All under flourescent lighting, which I loathe. Anyway, my bright idea was to bring my camera and individually snap each swatch that I like, so that I can glance at them, stare at them, double-take at them, walk casually past them….you get the idea. But anytime I get frustrated, I just pull up that photo of Deacon. Feel free to use it for some chuckles of your own!